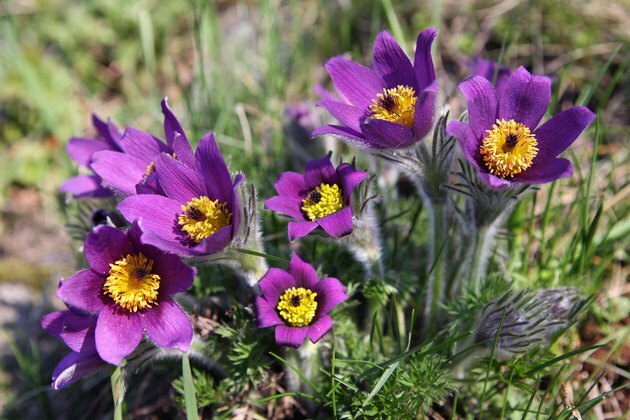 The pulsatilla homeopathic remedy is derived from the meadow anemone flower. The whole plant is used in homeopathic remedies of varying potencies. According to folklore, the flower was derived from the tears of the goddess Venus and is therefore used to alleviate the symptoms of being overwhelmed with emotions or sad for no known reason. It is considered a feminine remedy, used to treat shy people with changeable qualities. The pulsatilla homeopathic remedy is used to help shy and soft spoken people who tend to cry easily and are comforted by consolation, reassurance and hugs. These people constantly need support and are highly emotional, sentimental and sympathetic; can cry easily in front of others but may also flip-flop between emotions, getting irritated, frustrated and then emotional again. The pulsatilla remedy may help a child who is shy and clings to her mother, wanting to be held. On a physical level, the pulsatilla homeopathic remedy is used to treat ailments that involve the hormonal sphere and/or blood and circulation. Pulsatilla is often administered to women suffering from irregular menstrual cycles, headaches associated with menses, or aggravations due to hormonal changes during pregnancy or menopause. It can also be taken for wandering aches and pains in the body, and congestion--especially in the ears, eyes and nose. Pulsatilla homeopathic remedy can be found in many potencies, generally ranging from low levels like 6x, all the way up to 10M. The number/letter system corresponding to the potency is based on how many dilutions the remedy has had. The more dilutions, the higher the number and the stronger the dose of the remedy. Generally, acute symptoms are treated with lower potencies like 6X and taken every few hours until symptoms resolve. More chronic conditions are treated with higher potencies ranging from 30 to 200C. Higher potencies are taken much less frequently. For example, pulsatilla 200C can be given one time only for chronic conditions and not redosed until reevaluated in six to eight weeks. All homoeopathic remedies should be taken 20 minutes before or after eating or drinking, dissolved under the tongue, and all strong aromas such as menthol and coffee should be avoided. What are Homeopathic Remedies for Sleep Apnea?